Twice! That’s how many times you get your Seven Stars benefits the first time you achieve the level. You get your $500 dinner celebration twice! You get your Annual Retreat twice! The catch is that it takes a while to receive your Seven Stars membership for the first time and the benefits do not load for another week or so after that. This was my idea: I’d take a trip to my favorite hotel for New Years Eve using my Diamond Aspiration II and then finish up Seven Stars while playing there. I did this because I didn’t understand that I’d receive my Seven Stars benefits once when I first achieved the card and once again on the following February 1st. I received my Seven Stars membership status around January 10 and then my $500 dinner celebrations and Annual Retreat became available the following Wednesday. This left me with very little time to use the benefits as those would be removed (whether used or not) on February 1st and reloaded with fresh ones. The far better strategy would have been to use the Diamond Aspiration II in November, finish up Seven Stars, and then use the Annual Retreat with $500 travel credit and $500 dinners for a blow out New Years Eve trip, maybe even playing a little after the new year for a head start on next year’s status. Receiving this email means you have arrived at Seven Stars Status. Another disaster for me was the Atlantis Getaway that was made available to Total Rewards members. There was a book and travel cutoff of January 31, but the cutoff on the membership tier was December 28. With the lag in achieving the card after earning the points, I would have needed to make Seven Stars at least by December 15. As it stood, I could only book the Atlantis Diamond Aspiration II vacation. Norwegian Cruise Lines also provides Seven Stars members a deeply discounted cruise, but unlike the Atlantis Promotion, it does not load until as late as June making this a non-consideration. 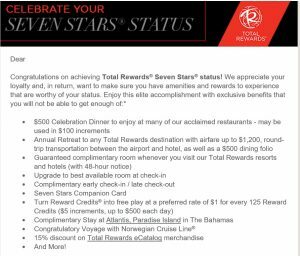 If you intend on earning Seven Stars with Total Rewards this year, plan to do it before December 1.